First you must learn the art of relaxation. AS A DIVER, YOU WILL probably go through periods when work or life takes you away from regular diving opportunities at home, and your annual underwater time is restricted to the odd short holiday. When this is the case, you understandably want to take full advantage of your limited leisure time and get in as much diving as you can in the time available. Liveaboard dive vessels provide the perfect solution. In the past few years, even in times of economic downturn, this is an area of the industry that has been growing fast, and the range of boat options and destinations is expanding all the time. The main benefit is more diving in remote locations where there is more marine life and less environmental damage. There will also be new kindred spirits to meet, no phone or Internet and no absolute beginners. The disadvantages include extremely limited nightlife, no escape-route if your new friends are not to your taste, no phone or Internet (yes, I know) and the possibility of seasickness. You wake up early. Often the vessel will have been sailing between sites during the night, and the changing note of the engine and the fact that the boat is no longer moving will rouse you from your slumber. You throw on shorts and a T-shirt and head for the galley for “first breakfast,” a snack and some juice to wake you up and give you energy for the first dive of the day. A little bleary-eyed, you greet your companions. 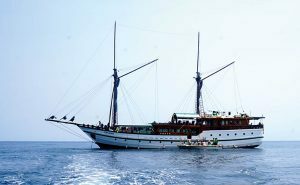 A typical liveaboard carries between eight and 16 divers. Your equipment is ready to go. You showed the crew how you like it set up on day one, and they’re quick learners. During the trip, your dive-gear lives on the dive-deck in the space allocated to you, and the crew takes care of all the pre-dive preparations. There is hanging room for wetsuits, but you will be diving so frequently that your suit will never get really dry. Depending on the boat procedures, you either gear up fully on deck or partly on deck and partly in the dive-tender. There is usually a great deal of flexibility to allow for physical limitations or personal preference. A full breakfast follows the first dive and from there the day progresses in a sequence of rest – dive – eat – rest – dive – eat until you fall into bed and are rocked to sleep by the sea. Every boat will have sunbathing spots and shaded reading areas on deck. A liveaboard trip offers a great opportunity to perfect your relaxation techniques. There will be a communal lounge with drinks and snacks throughout the day, and where you might be able to find a Scrabble game going on or someone running through their photos from the last dive. If you want privacy, you can retreat to your cabin, which will usually be a shared twin-room with bunks or single beds. If you’re travelling alone, you might find yourself sharing with a stranger. Many divers thrown together like this end up becoming life-long buddies. There are showers on deck and in the cabins, but remember that you’re on a boat, so be sparing in your use of fresh water, particularly the supply from the hot tap. If you don’t have a regular aerobic exercise routine, start one or, better still, go to the beach or a local pool and get some laps in. Acclimatise yourself, spend time outside at the weekends and ideally get a little sun. Buy travel insurance and diver insurance, including repatriation and recompression cover. Go through your dive-computer manual with your computer in hand and remind yourself how it works, how to program a nitrox mix and what the screen looks like in Dive mode and Deco mode. Check your dive-gear for mould and damage. Ask a local dive-club if you can join a pool session, and check everything for leaks. If you discover a problem, get the equipment serviced and then try it out again after it’s been serviced and before you leave. It might be best to avoid using manufacturer-logo bags that scream: “I have expensive dive gear inside!” Choose relatively anonymous lightweight luggage, long enough to accommodate your fins and fat enough for your BC and suit. Wheels and a strong frame are great to have, but balance those advantages against the increased weight. Some cases, even when empty, can use up a quarter of your international baggage allowance. Hand-carry small, expensive and difficult-to-replace items such as your computer or prescription mask. Of course, the usual travel advice about never packing essential medicines or papers in your checked baggage also applies. A small rucksack is a good choice for hand-luggage, as this can double as a day-pack for any land excursions you might make. It’s a great idea to bring a dry-bag and a net-bag. The former can either keep dry things dry in a wet area or, if drying time is short at the end of a trip, you can use them to pack damp things inside so that everything else in your case does not get wet too. A net-bag will help you keep your small stuff all in one place on the dive-deck and allow it all to drain between dives. It’s not unusual for divers sharing a cabin to become buddies for life. As well as your usual mask, fins, regulator, BC, computer and thermal protection, bring a back-up computer to carry on all dives, so that it has an accurate record of your inert gas-loading if your primary computer fails. You will be a long way from the nearest dive-store, and while a good liveaboard will carry a selection of spares, it’s best to be self-sufficient where the important things are concerned. So bring a spare mask-strap, a regulator mouthpiece and two spare fin-straps too. And bring a snorkel, even if you don’t normally wear one while diving. You might need it for dugong, dolphin or whale shark encounters. There is no need to bring shoes, apart from the ones you wear to travel. Everyone goes barefoot on board, and you can use your dive-booties for beach walking. Even if you’re used to fixing your own gear, don’t bother bringing your own tools. The boat-crew will have everything you need. You can also leave your fish-ID and marine-life reference books at home, because most liveaboards have an extensive library. A couple of final tips: first, take it easy and sit out a dive once in a while, even if just to give your inert gas-loading a break. Second, stick to whatever the boat rules are regarding dive-time. Your fellow-guests will not be impressed at your miraculously low air consumption if they have to sit on the dive-tender in the hot sun, waiting for you to come up. Also, if you’re the last diver back on board, you risk losing out on both hot water and hot food. What is the voltage on board and what format are the electrical fittings? Is there likely to be Internet access or a mobile-phone signal? Is there a sat-phone for emergency contact? What’s the number? What is the water temperature likely to be? What extras do I need to pay for? Are there dive-lights on board I can use? Is there a rental charge? Is nitrox available? Is there an extra charge for nitrox fills? What toiletries are provided in the cabins? Are towels provided in the cabins and/or on the dive-deck? What is the food like? This is particularly important if you have dietary requirements.